PIPPIN is our third-generation educational robot developed from the successes of PIP and PIXIE. By careful design and exploitation of up to date technology we have managed to achieve the capabilities of a sophisticated LOGO compatible robot in the ideal size of just 10 centimetres long. PIPPIN adds a simple music capability to the full turtle graphics command set of forwards, backwards, left, right and pause. Commands must be followed by a number to specify how much of that command is required. A typical simple program would be 10, 90, 10. 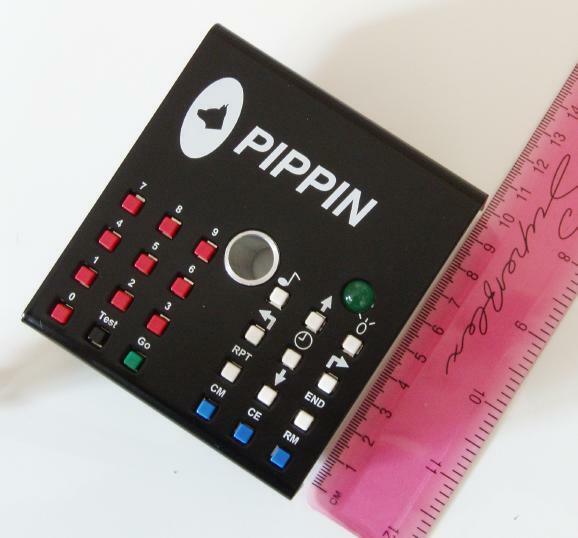 As PIPPIN moves in centimetres and degrees, the numbers that students use for movements and turns are of a similar size. So 90 centimetres is a sensible sort of distance to use alongside 90 degrees. If these movement units are not suitable, movement and turn units can be changed to a desired value. PIPPIN can repeat instructions. For example, if PIPPIN is to follow a square path, it needs to move forward and turn 90 degrees four times. This can be programmed by, for example, RPT 4, 10, 90, END. PIPPIN is our normal rectangular black box shape. It is easy to "aim" in a particular direction or line up with a course. A range of covers allows it to have many personalities.